Snakes are passive creatures often seen slithering in grass. 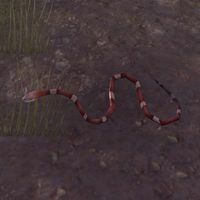 Some Giant Snake enemies in Craglorn are simply called "Snakes", and are slightly smaller than usual. This page was last modified on 19 July 2018, at 22:14.